In terms of the number of bets and markets football is by some way the most popular betting sport at NetBet. This operator offers odds on the main domestic leagues around Europe and international tournaments such as the UEFA Nations League. The site also features a casino and live casino, lotteries and poker. However, NetBet is predominantly a sportsbook and football gets the most coverage of all the sports. The NetBet parent company has been involved in online gaming since 2001 and the brand has been in operation as a sportsbook since 2013. This bookmaker has had a negative reputation in the past and slow payments haven’t helped. The main focus in the sportsbook is football and this review looks at the promotions and betting markets for the sport. The NetBet football betting product is not exceptional. Multiple bets placed on the same event will not count towards rollover and also considered as bonus manipulation and the bonus will be. 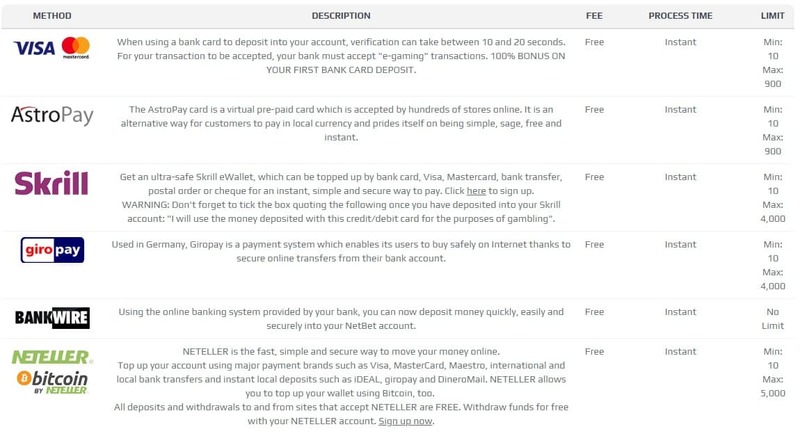 Deposit methods NETELLER and Skrill are not eligible for this promotion. Clients can only claim one NetBet welcome bonus. Customers having previously used another welcome code will not be entitled to this offer. In the event of misuse, the accounts of the players responsible will be closed with immediate effect. T&Cs apply. How Does The NetBet Sign Up Offer Work? Matched free bet for up to £50 that can be staked in the sportsbook including on NetBet football markets. New customers must complete the registration process. Make an initial deposit and place a bet at odds of 1/2 or bigger. New account holders are then credited with £50 in the form of a free bet. 100% matched free bet on the first settled sports bet. Minimum stake of £10 on a single bet. The free bet will appear in an account within 24 hours of the qualifying bet being settled. The free bet stake is not included in any winnings from the free bet. The NetBet football welcome offer is a genuine 100% matched bonus. The free bet must be turned over just once before a customer has access to the funds. The odds restriction is better than average. The bonus is achieveable and the rules are clear and easy to understand. As a means of attracting new customers, the offer is a good free bet promotion. 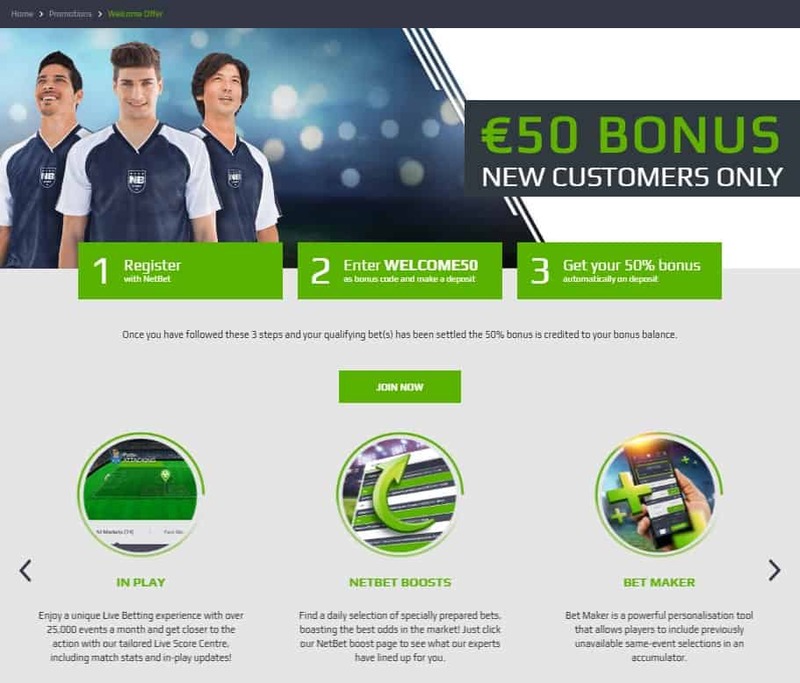 The NetBet new customer offer is not sport specific. The operator also offers ongoing promotions for existing customers. These bonuses apply to football and other sports and customers are rewarded for their loyalty with a good selection of bonuses and concessions. Here are the existing NetBet football promotions that also apply for other sports. The NetBet football betting product covers several European leagues including the English Premier League which is the most popular for betting in the world. The NetBet football service is complimented by Fantasy Football. Existing customers build a squad and there are cash prizes for the players that create the most successful teams. Each entry has a squad of 15 players from the Premier League who are purchased using a budget of £100 million. There are weekly, monthly and season long prizes in the form of free bets but the amounts involved are small. If players are tied over any period of time the free bet is divided amongst the winning entries rather than each winner receiving a free bet for the full value of the prize. In reality the free bet values are minimal and are even smaller when the prizes are shared. NetBet offers odds enhancements for selected matches as part of the NetBet online betting service. New and existing customers can place a bet on the winner of a football match at better odds. For example a team might be 5/2 to win a match and NetBet will increase the odds to 4/1. Any markets with boosted odds cannot be combined in multiple bets. Individual selections in an accumulator will not be boosted but there will be better odds as part of the acca and combination odds boost promotion. Odds boosts are most common for the bookie football betting. The boosts are often related to the major NetBet football fixtures in the English Premier League and the Champions League. These matches involve the most high profile clubs and are shown live on television. Existing customers with NetBet receive a boost of 50% on winning accas with three selections or more. The odds enhancement applies to trebles or bigger in NetBet football betting markets and other sports. Winning accas are boosted from 3% to 50% depending on the number of selections, from three to 13 or more. Each selection in the acca must be at odds of 1/5 or bigger and the selections can be from NetBet football markets or a selection of sports. The acca boost promotion only applies to pre-match bets and in-play bets are not valid. Bets on football can feature matches from about 50 leagues, including the main European top divisions. Any cashed out bets do not count. The football acca boost promotion compares favourably with similar offers with other online bookmakers. Customers who take part in NetBet football betting can add new selections to unsettled bets. This promotion applies to pre-match and in-play football bets and betting on other sports. Existing bets can be enhanced with more selections during the event or after the first match has begun. The original and new selections appear on the betting slip. The combined odds are updated and funds from cashing out the original bet are used to cover the initial and additional selections. The most popular fixtures for this application are the high profile matches which provide the most football markets. The stake amount is based on the cash out amount and cannot be amended. The stake calculation is adjusted in favour of the bookmaker and more selections in a bet are better for the bookmaker than the customer. NetBet offers odds on over 40 sports and the number of NetBet football markets is greater than the total for all the other sports. The most popular leagues are displayed and usually most of these are related to football. 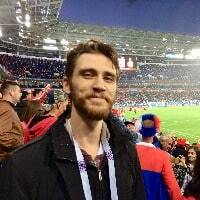 At the time of writing there were upcoming matches in the UEFA Nations League. The 1X2 match winner odds are compiled with a theoretical profit margin of 6% which is about average. The range of markets compares favourably with the competition. The interface is clear and informative. The actual betting is organized under Top Leagues and All Leagues. The top leagues are the main divisions in England, France, Germany, Spain and Italy and international fixtures. NetBet has odds for over 200 leagues in total including the main domestic leagues in South America. The site features game odds and outright betting markets. Odds are updated after each set of fixtures and customers can bet on the league winners and teams to be relegated throughout the season. Ante post betting is available on domestic leagues, the Champions League and Europa League and upcoming international tournaments including Euro 2020 and the 2022 World Cup. The NetBet football in-play service features matches from all around the world. Football accounts for the most live events but customers with NetBet can also bet in-play on events in tennis, ice hockey and basketball and other sports when there is a significant live event. There are about 40 markets for betting on a live football match under the headings of popular, goals and halves. The graphical interface shows the position of the ball and the team in possession. Odds are suspended when there is a goal or another significant event that causes the odds to change. A Live Schedule lists the upcoming in-play fixtures in football and other sports. Football is also one of the NetBet virtual sports which also include horse racing and greyhounds. The Bet Maker facility enhances the NetBet sports betting service. When an initial selection is made customers are given the option to include combinations that have not been offered in the past. Bet Maker is the NetBet football version of customised betting. Accumulators can be created from a range of markets such as the full time result, number of goals and corners and goalscorers. Some of these match events are related so the accumulated odds are adjusted accordingly. New NetBet football app mobile customers who place the first free bet. Qualifying bet of at least £10. Minimum odds of 1.60 for a single bet and minimum odds of 1.60 for any element of a combination bet. The free bet will be credited within 24 hours of the qualifying bet being settled. The free bet expires after 7 days. The free bet stake is not returned as part of any winnings. The mobile qualifying bet and free bet can be placed on a the bookmakers football app market. The mobile version is fully functional and features all the sports and leagues that are available on the desktop version. The app can be downloaded for mobile use. There is an Android and iPhone download version. The app is one of the best betting apps on the market. Betting can take place in a secure and reliably mobile environment. The mobile platform is stable which means coverage is unlikely to be lost during the bet placement process. The sports and the NetBet betting app is a good compliment to the desktop version. The desktop version also utilizes the latest safe and secure software which makes for a good betting experience on a wide range of sports, leagues and markets. Football accounts for more than half the bets at NetBet but there are also betting markets for another 40 sports. At the time of writing there were most bets for tennis and basketball after football. Customers with NetBet can bet on about 50 basketball leagues, including the NBA in North American and the main European leagues. There are tennis odds for the two main tours for men and women and matches in tournaments below the highest level. The site features outright betting for the upcoming Grand Slam tennis championships. NetBet customers can place bets on horse racing at meetings in the UK and Ireland and major international fixtures. The sports menu features the main betting sports and some of the more obscure and niche areas such as E-Sports. Markets for horse racing, basketball and American Football appear in the most popular list alongside NetBet football leagues. 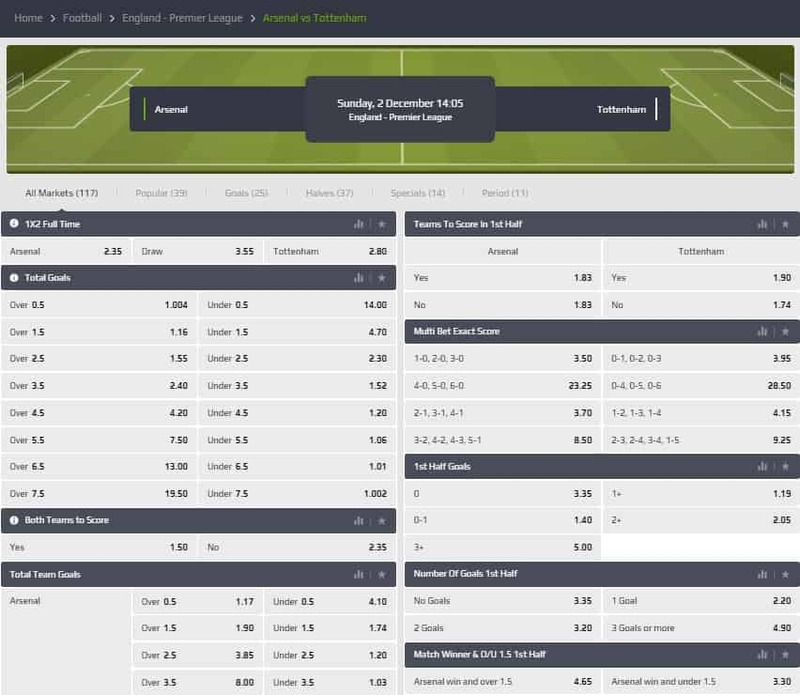 The Bet Maker feature allows customers to combine options to create a personalised bet for events in a football match. Existing customers login by entering a unique combination of the Username and Password on the NetBet Home Page. Potential new customers click the NetBet button on the same page. There are four registration screens to complete in order to create a new account: Your account, Details, Contact and Bonus. The registration process involves entering an optional bonus code. Once the new account has been accepted new customers are prompted to make an initial deposit. The process involves selecting a deposit method and specifying the amount. The first bet which must be a single line bet for at least £10 activates the bonus. When the odds in a market are selected the Betting Slip appears. The potential winnings at the current odds are displayed when the stake is entered. As more selections are entered the possible bets are displayed. Bettors click the Place Bet button and the bet is confirmed. The customer account balance is updated immediately to reflect the stake. The three basic processes take about five minutes and are easy to understand and follow. Customers with NetBet can deposit funds using a wide range of payment options including debit and credit cards, a number of e-Wallets and bank transfer. There are no fees and process time is instant. Across the range of banking methods the minimum deposit is £10 and the maximum deposit is £5,000. There are no charges for cashing out betting funds but process times seem excessive which is one of the main negatives with the brands online betting. The minimum deposit is £10 and the maximum is based on the funds in an account. The bookie customer support department is open from 12:00 to 2000 GMT, every day of the year but this is a small window. Support staff can be contacted by telephone, an email form on the website and through Live Chat which offers the best response times. The service is available from 09:00 to 23:00 UK time. There is also a comprehensive Help Centre that covers the key site operations. The FAQ facility covers many of the most important functions of the site. NetBet is committed to responsible gambling and displays banner links to organizations that provide support. NetBet is owned by NetBet Enterprises Limited which is based in Malta. The site is licensed and regulated by the UK Gambling Commission. The company was founded in 2001 under the name of Casino770. The NetBet brand appeared in July 2013 and it has been suggested the rebranding was carried to dissociate the company with the negative reviews of Casino770. Any operator that has been in business since 2001 will have a questionable background but NetBet has established some trust despite some uncomplimentary reviews. Despite some negatives and uncomplimentary reviews the overall NetBet betting experience is positive. The main criticism seems to be the slow processing of payments which is anecdotal and not based on personal experience. This could be a legacy of the previous branding but funds should be transferred to a customer’s bank without delay. The situation seems to have improved and there doesn’t appear to be anything sinister about the late payments. The welcome offer is for a decent amount and is transparent and achievable. The range of NetBet football markets is extensive and many other betting sports are well covered. The in-play betting product is decent and the odds margins are about average. The sportsbook offers many gambling options across the main betting sports and some of the more obscure.